Jacques-Yves Cousteau (11 June 1910 – 25 June 1997) was a multifaceted personality - French naval officer, explorer, conservationist, filmmaker, innovator, scientist, photographer, author and researcher who studied the sea and all forms of life in water. He co-developed the Aqua-lung, pioneered marine conservation and was a member of the Académie française. 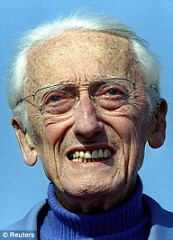 Cousteau described his underwater world research in a series of books, perhaps the most successful being his first book, The Silent World: A Story of Undersea Discovery and Adventure, published in 1953. Cousteau also directed films, most notably the documentary adaptation of the book, The Silent World, which won a Palme d'or at the 1956 Cannes Film Festival. In this issue we have given a few of his quotable quotes. In this month, we are giving coverage to a less known letter by John Stewart the Headmaster to Abraham Lincoln. This letter is equally powerful like that of Abraham Lincoln. In happenings section, we have covered training programmes on Azolla cultivation, Terrace gardening, Traditional Siddha Varma Bone setting practices, Networking programmes and developing Social capital by way of Personality Development and Family Camps. In the wisdom section, Ashvin Metha, a Philosopher more than a Nature Photographer emphasizes Reverence towards Nature for the survival of mankind. Shri Sisirkumar Ghosh, who spent most of his life at Shantiniketan forcefully writes that we have almost killed the mother earth and finally the famous Environmentalist Shri Vijay Paranjpye highlights the role of Traditions and Customs in Water management.